I continue my Love Themed Card Series with a quick and last minute post for this week’s MFT Sketch Challenge #369MFT Sketch Challenge #369. I had a pre-coloured little elephant from the Adorable Elephants set (I used Zig Clean Colour Real Brush markers on Bristol Smooth cardstock) which I wanted to use. First I created the background by sponging Distress Oxide inks on Bristol Smooth cardstock, then added more ink through the Staggered hearts stencil. I moved the stencil several times and added more ink for more dimension. The Colours used are: Candied Apple, Picked Raspberry and Worn Lipstick. I die cut the panel with a stitched rectangle die after it dried. 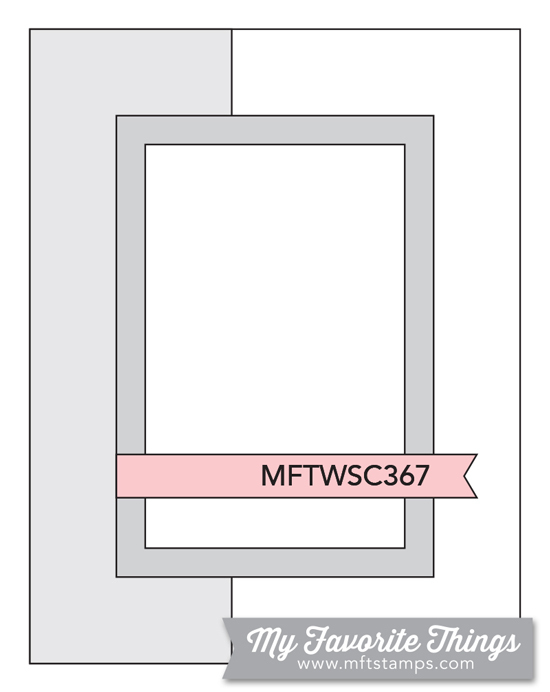 I also cut a Linked Chain Circle Frame from white cardstock and a heart using a die from MFT Blueprints 22. On this piece I sponged the same Distress Oxide inks and added some splatters using Aged Mahogany distress ink. I added this darker colour to the edges, to make the heart stand out. I also spritzed it with Tsukineko Shimmer Spritz for a bit of sparkle. When it was done, I put some Crystal glaze Nuvo Drops on the entire piece but it looked like a big blob so I removed it all with a piece of typing paper. Still it left some residue which gives a subtle shine to the heart embellishment. The sentiment is from the More Essential sentiments set, white heat embossed on black cardstock. I used 3D foam tape when assembling the card and little heart sequins from Pretty Pink Posh as final touches. 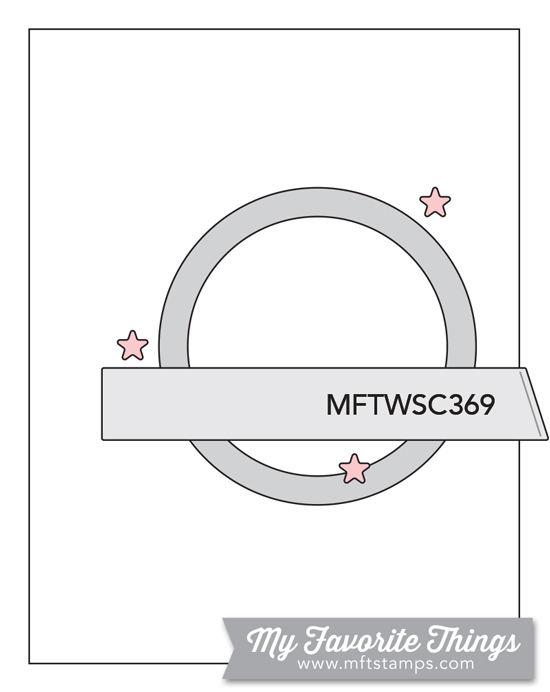 I will linkthis projct to the MFT Sketch Challenge #369. I hope you like this simple, technique-driven card design and will return for more inspiration soon. I am back with the usual Monday inspiration for the current Inky Paws Challenge #64. The sketch is so gorgeous, not only for Valentine’s Day, but other occasions too. My daughter is turning 7 years old in a week (unbelievable!) and I wanted to make her a card which I will give on her big day – as we celebrated already over the weekend due to my husbands work shift starting on Friday. We cannot have a party without daddy. I knew I wanted to use the Once upon a princess stamp and die set from Newton’s Nook Designs, but before I started the colouring, I looked through my patterned paper drawer for the right papers to go with the sketch and the theme. I love Doodlebug and their Fairy Tales collection seemed to be a perfect match. I used Copic markers in coordinating colours to bring my princess and castle to life. I love that the die cuts little holes under the arms and the flag, it makes it look like cardstock stickers. Perfection. Then I die cut the elements for the sketch, a heart, a rectangle and a thin strip of patterned paper to hold my white heat embossed sentiment. I used 3D foam tape to assemble the card, in this way I got so much dimension. I added a bit of Tonic Aqua shimmer pen on the dress for the sparkle (a princess needs that right? ), and some glossy accents to emphasize some details. I used pretty gems from Studio Katia to finish it off. I will upload this project to the Simon Says Stamp Wednesday Challenge Layer it. I hope you like my card and got inspired to participate in the Inky Paws Challenge. You have time until Friday (2nd Feb) to upload your project to be eligible to win the 20 USD gift certificate to the NND online store. Thanks for stopping by, I hope to see you back here soon. I started with colouring the cute birds from the Season’s Tweetings mini set and cut them out with the coordinating die a couple of days ago as part of the 30days colouring challenge organised by the wonderful Kathy Racoosin. Then I die cut some snow banks and birch trees from white cardstock using Lawn Fawn dies. I also cut the Love Ya sentiment from white and hot pink cardstocks and layered them together. I assembled my scene on a piece of Lawn Fawn patterned paper so it covers the fron of an A2 sized card. I used thin 3D foam tape to get more dimension. I stamped the other part of the sentiment on the smaller snowbank using a dark pink ink. I also die cut some hearts from a pink alcohol inked background I made earlier and covered them with glossy accent. I added some Diamond stickles to the accessories of the little birds for some extra sparkle. 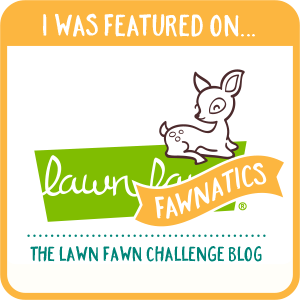 I will link this project up to the Lawnfawnatics Challenge #21 and the Simon Says Stamp Wednesday Challenge: Layer it up. I hope you like my card and will pop in tomorrow for some birthday fun. It has been a bit hectic here with all of us being sick with a nasty stomach virus, but slowly we are getting back to normal. I will continue the Love Themed Card Series with cute flamingos. Today a new challenge is starting at the Inky Paws Challenge, #64 is a pretty sketch perfect for Valentine’s day cards. I started with die cutting a lacy heart (Lawn Fawn) from dark pink cardstock and masked off the lacy part of it with post it notes. I stamped the flamingos from the Flirty Flamingos stamp set from Newton’s Nook Designs and used Prismacolor pencils to add a bit of colour to them – mostly white. When it was done I went over the outlines with a black permanent marker, added some Tonic Aqua Shimmer and glossy accents to the beaks. To construct my card, I used Doodlebug patterned paper, I die cut a stitched rectangle from it and adhered it to a white card base. Then I ran a piece of Audrey Blue rectangle through the Big SHot machine with the Stitched Woodgrain die from Lil’Inkers Designs. At last I also die cut a stitched strip to hold my die cut sentiment (Simon Says Stamp) and white heat embossed the rest of it above (from the MFT PI I heart you set). As a finishing touch I added some iridescent hearts from Studio Katia. I hope you like my card and will participate in the new sketch challenge at Inky Paws Challenge. You have 2 weeks to link up your projects (until the 2nd Feb) on their website and you might be the lucky winner of the 20 USD gift certificate to the NND online store. I will link this card up on the Simon Says Stamp Monday Challenge Birds of a feather and to the Simon Says Stamp Wednesday Challenge Add a sentiment. Hope you pop in again soon for more crafty fun. 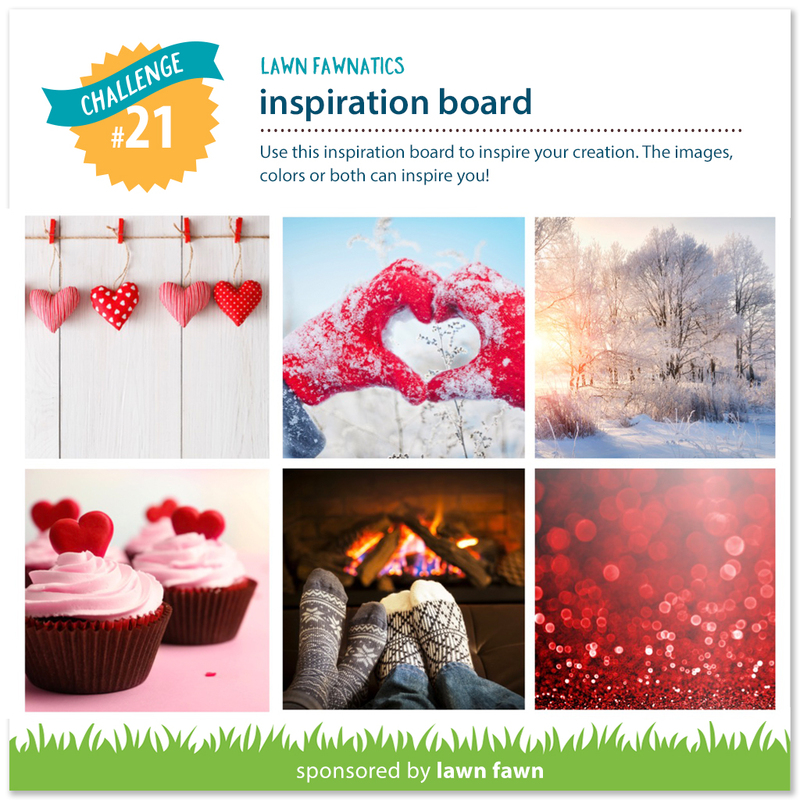 It is Monday and I am back with fresh inspiration for the Inky Paws Challenge #63. I needed some thank you cards to send to my friends and I knew I wanted to play with alcohol inks for the pink challenge. I used pink shades of inks and a bit of gold and pearl mixative. This is the design I came up with. I gold heat embossed the beautiful snowflakes from the NND Beautiful blizzards stamp set. I cut the embossed alcohol ink backgrounds with a stitched rectangle die and gave it a gold mat. I used 2 different embossing powders and 2 different gold cardstocks to match the embossing. Then I adhered the panels to the a stitched scalloped frame from Frames and tags. The sentiment is a Simon Says Stamp die cut several times from white cardstock, golden cardstock and white glossy cardstock. I stacked them together and adhered to the card front. I hope you like my set of cards and you got inspired to play along the Inky Paws Challenge #63. Hope to see your creations there. 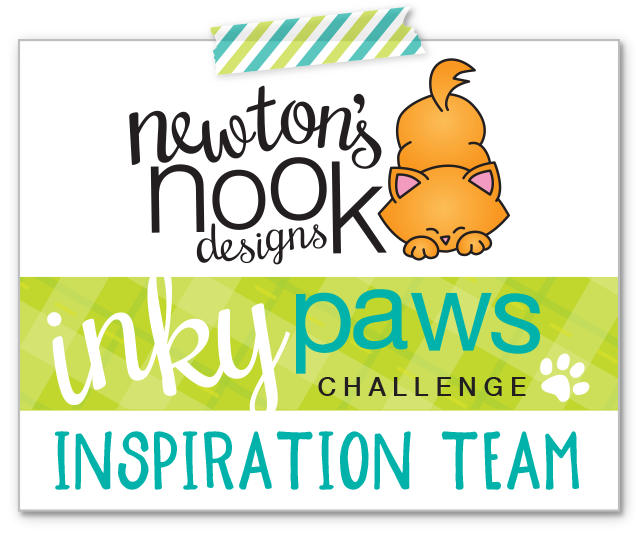 You have until Friday (19th Jan) to link up your project to be eligible to win the 20 USD gift certificate to the Newton’s Nook Designs online store. Thanks for stopping by, see you soon with another fun project. Foreword: I have decided to start a Love Themed Card Series after seeing how much you liked the Halloween and Holiday one last year. This is my first card within the series. Enjoy! It is finally weekend and I managed to put together a card I dreamt of 2 days ago. 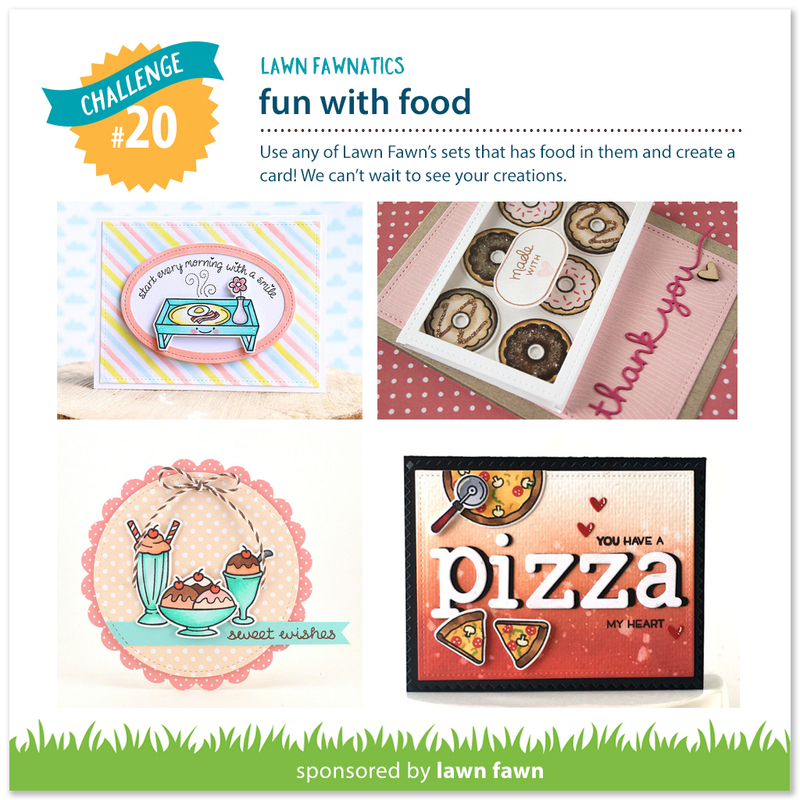 I imagined a very colourful and sparkly card with lots of cupcakes for the Lawnfawnatics challenge #20 Fun with food. I started with stencilling the clouds with distress inks on Bristol Smooth cardstock. Then I used another stencil (Honey Bee Stamps) for the sun rays and before removing the stencil I sprayed Tsukineko Shimmer Spritz over it for a subtle sparkle. I ran it through the Big Shot with a stitched rectangle die to give it a nice finished look. Then I stamped my custom sentiment using Owen’s ABC and Guava ink from Lawn Fawn. The rest of it is from the Baked with love stamp set, stamped in black. When the stamping was all done, I die cut the panel with a Puffy cloud border die. The cupcakes are all from the Baked with love stamp set, coloured with Copics and cut out with the coordinating dies. I used 3D foam tape to pop up the cloud border and the cupcakes. And now the embellishments. I sprinkled quite a lot of iridescent star sequins using Ranger Multi Matte medium. I also added Tonic Aqua Clear Shimmer and glossy accents to the cupcake holders. Then for the first time ever I pulled out my Tonic Jewel Drops and added teeny tiny dots to the cupcakes as little sprinkles or icing. I am in love with the end result, it is just gorgeous! 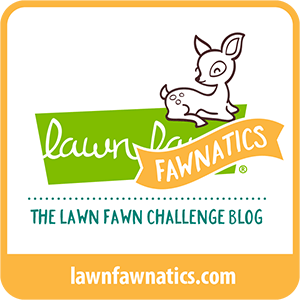 I will submit this card to the Lawnfawnatics Challenge #20. I hope you like my card and will return soon for more fun.